Many government departments use Citizen Space to host online consultations. We think this is great because we want to encourage running consultations online - and it’s worth mentioning that there are other online participation tools, e.g. SurveyMonkey, for which the advice in this post could be adapted. Select the checkbox for ‘This consultation is held on another website’ in the publishing interface. 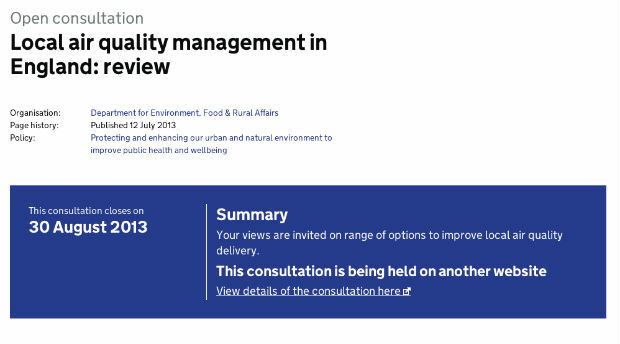 This will activate the new design that makes it clear the consultation is held elsewhere, rather than just having the ‘respond online’ link at the bottom of the page, where it is less prominent. When you supply the link for where the consultation is held, don’t use the link for your Citizen Space consultation hub, but deep link into the consultation itself. If you’re hosting the consultation documents on Citizen Space, or better yet integrating the consultation text on web pages with the questions, then you do not need to also upload the consultation documents to GOV.UK. You do still need to add the metadata for the consultation - the open and closing dates, heading, summary, description, related policies or topics and organisations. This is so that we can provide a complete list of government consultations on GOV.UK, and people can search or browse for them easily. We continue to chat to Delib, makers of Citizen Space, about how to help departments run great consultations.